I've been into cosplay for a long time, starting in middle school, but I used to mostly just sew the clothes and then wear them and didn't overly concern myself with quality. Then I made close friends with an extremely meticulous, detail-oriented cosplay fanatic with ridiculously high standards and, essentially, everything changed when the fire nation attacked. So now I kind of take it pretty seriously and spend almost all of my non-rent non-groceries money on fabrics, trim, patterns, wigs, makeup, etc, and it's made a huge difference. I just got back from a 4-day anime convention where me and aforementioned friend wore two sets of costumes that I'm super proud of. 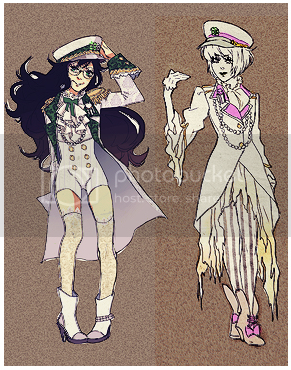 The first are military-inspired designs of Homestuck characters bymookie that are sort of punk and sort of asian street fashion and pretty awesome. 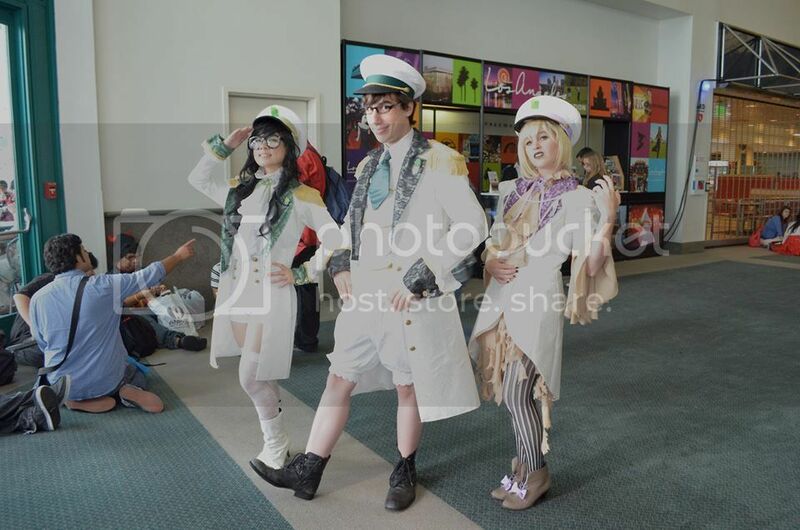 we cosplayed these same designs last year, too, but the coats hung a little stiffly because I used too tough of an interfacing, and basically it was a learning experience and I spent this last year re-sewing my entire coat and fixing the bottom of my friend's. This year I have nothing to complain about. We look hot. in addition to fixing how the coats hang, I changed the cut of my coat (my friend's idea to make it look more flattering and accentuate my hips) and added the fancy lace to her cravat pictured here. 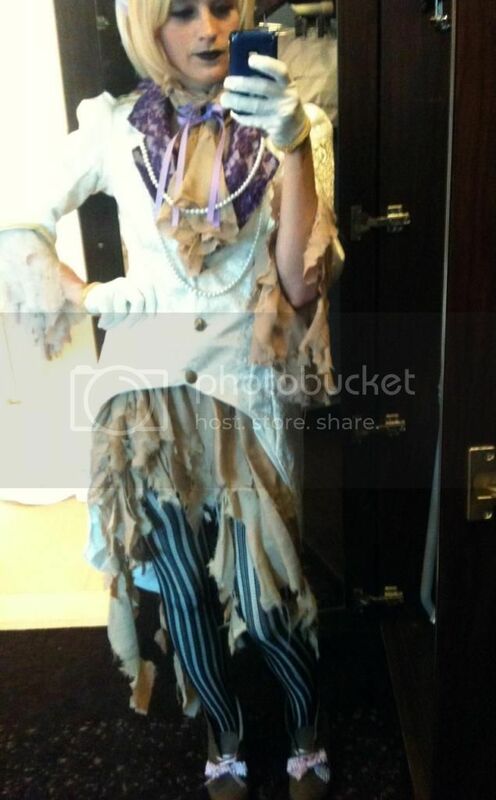 i also tattered my sleeves to make them match my bottom skirt, and made myself gloves to which I added trim. I'm pretty proud of this wig too because I actually sewed part of the wig to itself to give it that little anime loopie thing at the top. My friend did the rest of the cutting and styling, though, and in return I did the sewing. Cool stuff, CL! 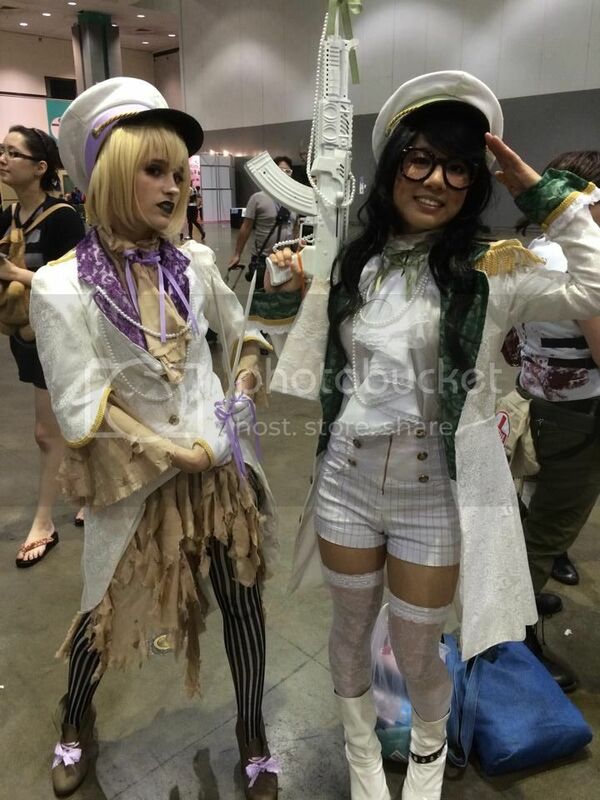 I have to ask, how many people actually recognized the Militarystuck cosplays? That strikes me as a surprising off-shoot thing to dedicate a full cosplay to. You definitely pulled it off, though, no doubt about that. To answer your question, since the HS fandom--past and present-- is so big and a large portion can be found on tumblr (on which mookie is a well-known artist), a decent amount of them recognized exactly what we were. 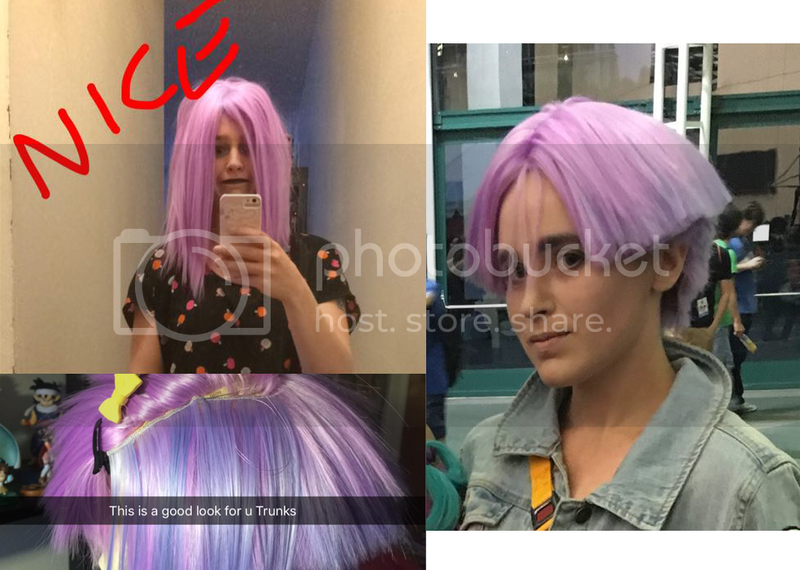 Even the HS people who didn't recognize the specific designs still recognized our characters because the hair, black lipstick/glasses, and colors (purple and green) are iconic to those characters. Nice! That answers my question, and is awesome to boot. Very cool! ^I'm glad you asked, because fun fact: CL is actually made entirely out of buckyballs & papier-mache. putting this one up because even though it's less of a great quality shot, it really shows how much better the green coat hangs this year. I fixed the back of that one too, which you really can't tell from these pics obviously, but the front doesn't curve in anymore and flares out nicely instead. e: also i def uploaded your edit to tumblr bc it's super hot, thanks AI!! 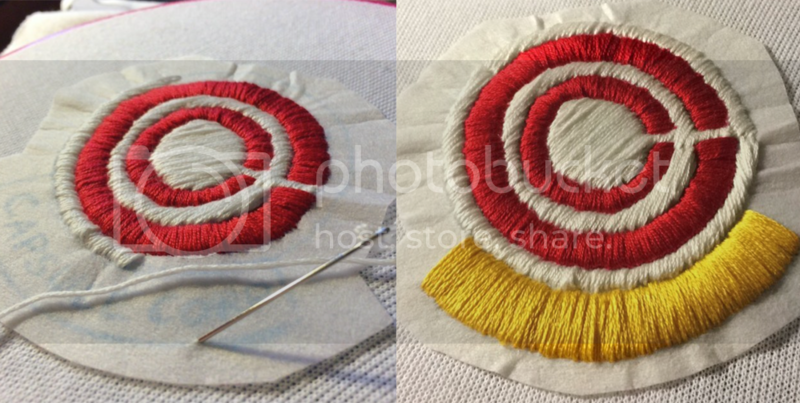 I like the closer shots so I can see the detail on the fabric! You should take a photo of the clothes, so we can see that cool patterning in higher detail. And you're quite welcome, you bet I already saw that post and liked it. You lot look both really badassed and cute at once. 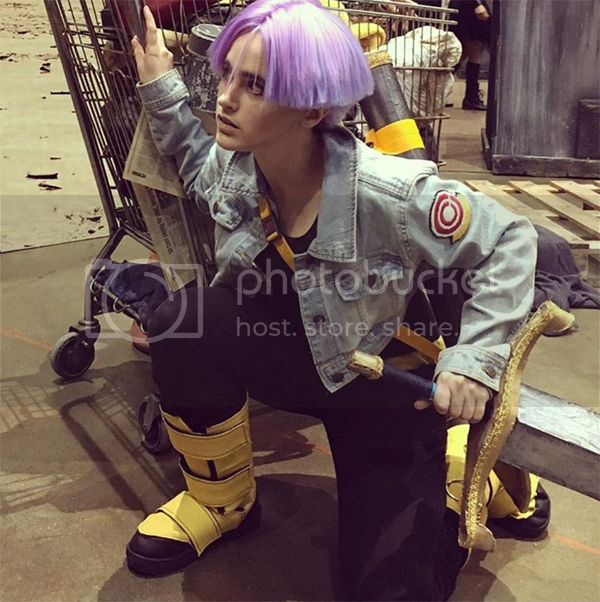 What is this cosplay of? The man who is blind, deaf,and silent lives in peace. ...She says in the OP. And a couple times after that. I wish I just had this level of commitment. I get awesome ideas and then never follow through. if it's any consolation, i average about one pair cosplay per year. slow and steady wins the race. until it's almost con time, then you pull all-nighters for like a week and stress over whether or not your wigs will arrive on time. Pretty neat but I'm unfamiliar with the source of whatever you're dressing as. Glad you're having fun, keep it up, quality pics. 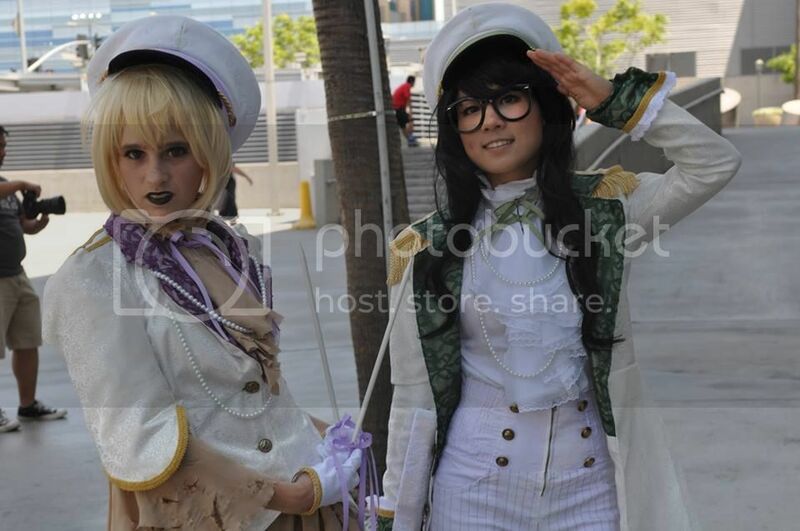 2 YEARS LATER BUMP BC GUESS WHO FEELS LEGIT AS HELL AFTER THIS YEAR'S ANIME EXPO!!!! 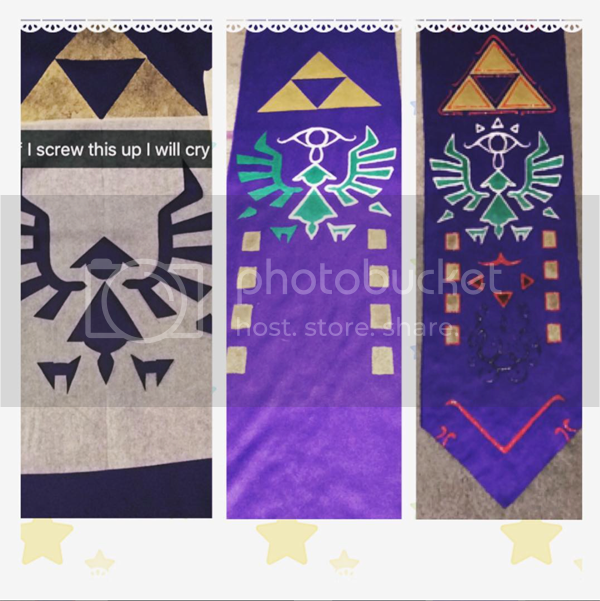 I made 2 costumes that I am super, extremely ridiculously proud of. 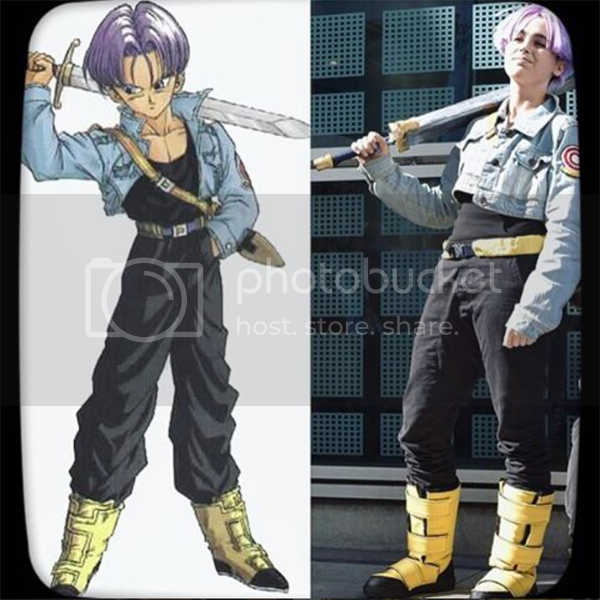 The first is my husband/son/one and only Future Trunks. I based the colors on the manga rather than the anime because I like the red and yellow Capsule Corp logo. The wig was a nightmare, let me tell you. I spent 15+ hours of my life sewing in wefts of blue wig hair to add to the pink wig I got, for two reasons: to thicken it (the undercut in the back was too thin, you could see the net underneath so I had to add in a bunch), and to make the overall color slightly closer to the blue in the manga. Then there was the issue of his stupid space boots. Like? Wtf??? I ended up basing them more on his design in DBS than DBZ just becauese they are slightly less stupid. 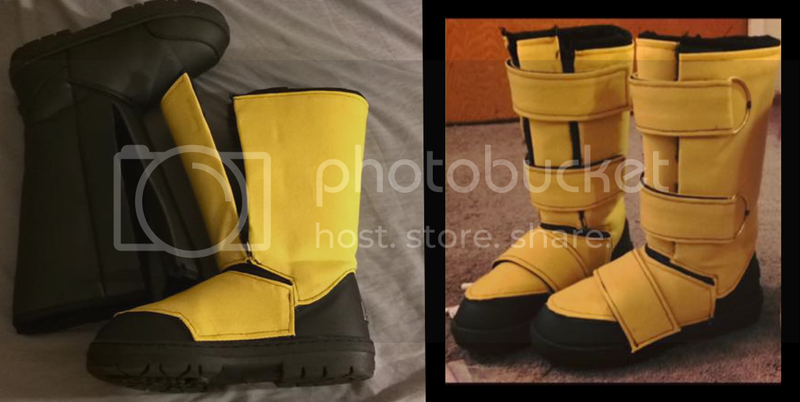 I ended up just buying black rubber knockoff UGGs and covering them up, then adding straps. And finally, but absolutely not least....... we have the Big Anime Sword. I didn't really document the process for that one though because it was like 2 days before the con and I was exhausted and just wanted to get it done. 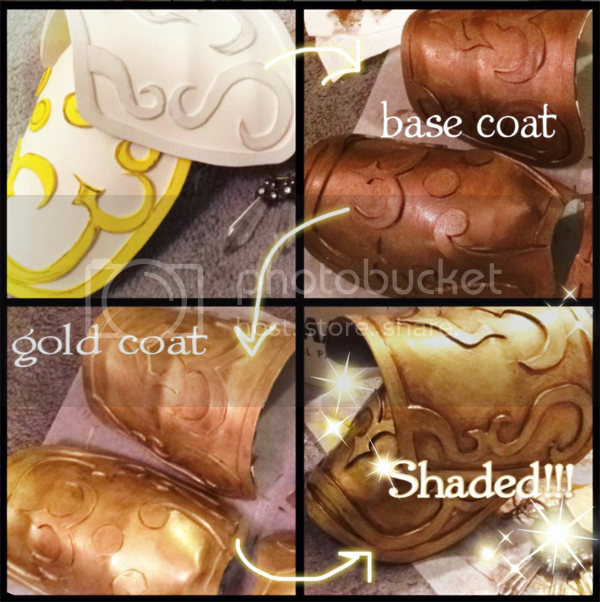 All you need to know is it took a wooden rod, meticulously measured cardboard foam, masking tape, modpodge, and sooooo much metallic paint. OKAY THE OTHER MEGAPOST IS HAPPENING NOW. 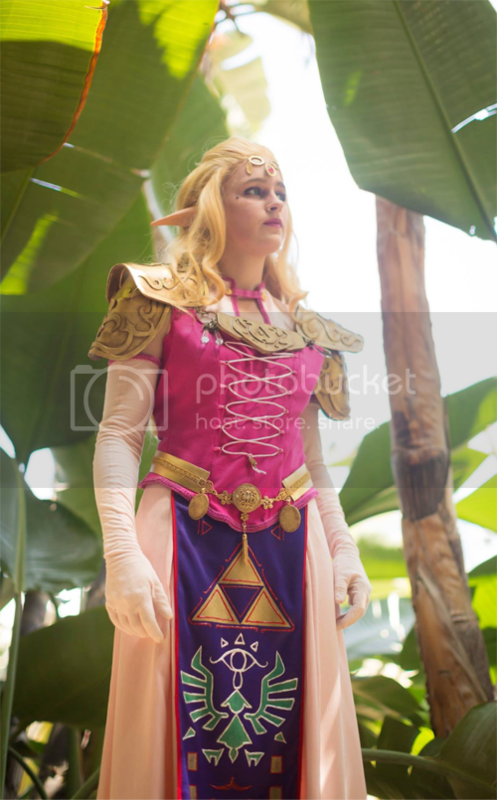 I have literally wanted to cosplay Ocarina of Time Zelda since I was like nine. I was playing OoT3DS about half a year ago (more? 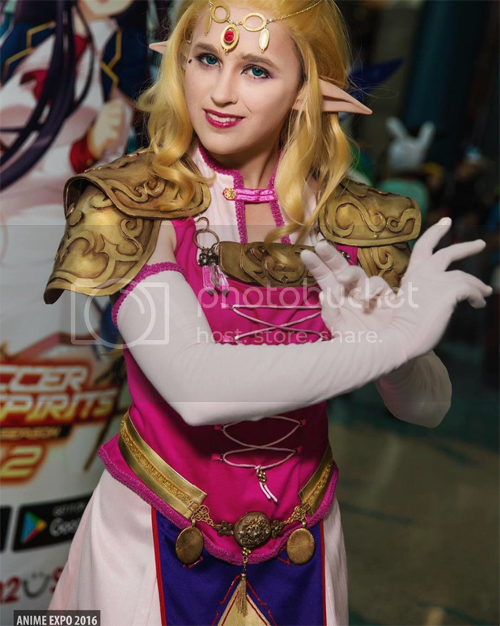 idk) and finally finished my lens-of-truthless file, and when I got to the end with adult Zelda all of my cosplay dreams came rushing back to me and I was like....... SCREW IT!!!! WE'RE DOING THIS!!!!!!!! 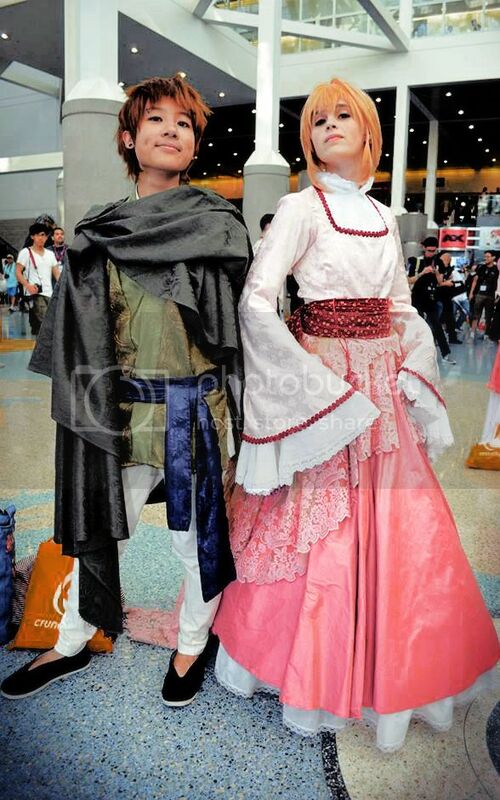 This cosplay. Was. Such an ordeal. WHY PRINCESSES GOTTA BE SO FANCY? The two lines of pink trim around the bottom of her skirt amount to approximately 15 episodes of Dragon Ball Super's worth of handsewing. I know this because I handsewed them while watching approximately 15 episodes of Dragon Ball Super. Again. so much paint, so many tears, so little sleep. But it got done!!!! Now, you may have noticed that the jewelry on her belt and her circlet are not 100% accurate to her design. This is because I found that trying to make accurate shapes out of foam led to them just looking fake and tacky, and so instead I just bought pieces of real jewelry and painted them the right colors and strung them together as best I could. My priority was looking fancy rather than accurate. 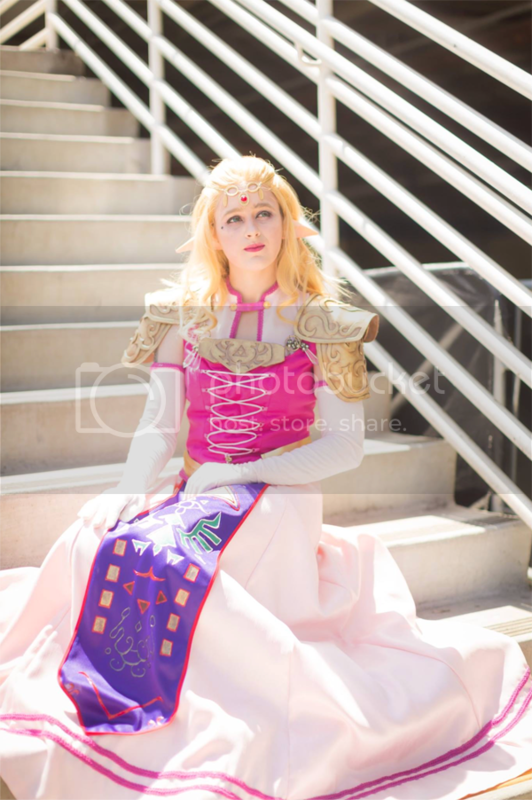 Also, fun fact about this costume -- I wore like 5 inch platform heels under it to give the illusion of me having slightly longer and more elven legs than I actually do, and hemmed the dress to that length. So if I try to wear this without those shoes it drags on the floor. SO. BOOM. IM A REAL PRINCESS.